How about some soft fluffy roasted potato with mayonnaise? Sounds mouthwatering? Baby potatoes or fingerling potatoes can be rightly cooked in a little by using our very own conventional pressure cooker. You can add your seasoning according to your taste to reach a delicious end result. You need to cook whole raw potatoes till they get brown in colour and tender. Don’t forget to pierce the potatoes with fork or knife just before pressure cooking, it will keep the skin intact and it won’t divide. 1) Place the pressure cooker in the gas oven and pre heat. 2) Put the vegetable oil in the cooker, let it heat and then add the potatoes, garlic and rosemary step by step. 3) Roll & fry the potatoes for few minutes until the outside of the raw potatoes get brown or golden. 4) Then, make a small stab or prick in the middle of each potato with a fork or knife and after that do not stir the potatoes, any longer. Pour the vegetable stock in the cooker. 5) Close the lid of the pressure cooker and lock it. Cook them in high heat and once the cooker has reached high pressure, lower the heat and let it boil for 5 minutes. 6) Let the cooker release pressure in usual way. After ten minutes, open the cooker lid, remove the outer skin of the garlic cloves; you can smash it if you want to. Your roasted potato is ready to serve! Sprinkle with salt and pepper according to taste and serve hot with finger licking mayonnaise! There’s no one who can refuse the benefits of the pressure cooker. Pressure cooker is one thing which can help slow cooking done quicker. 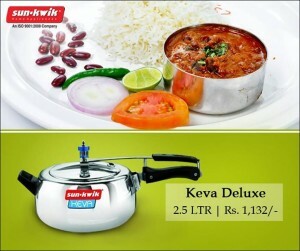 A pressure cooker is the beneficial product for your kitchen which can decrease the cooking time on the whole. Take advantage of the sunkwik pressure cooker and attempt some of these healthy recipes. They can save you significant amounts of time! I am providing some of healthy recipes for a new set of pressure cooker fans. Let’s read about how to make tasty potato salad in a pressure cooker. At first, peel off the potatoes skin and prick them with a toothpick. Keep the potatoes in the pressure cooker with right amount of water and a pinch of salt. Cook the potatoes on high pressure for 3-5 minutes. After opening the lid, if the potatoes are not cooked, cook them for another few minutes. Let the steam discharge naturally, after that dice potatoes when they are cool enough to hold. Take a large bowl; make an alternate layer of boiled potatoes, onions, and celery. The most important part is seasoning. Sprinkle some salt and pepper according to your taste. Add the chopped eggs and then sprinkle the chopped dill. Mix up the mayonnaise, mustard sauce, and cider vinegar properly together in a small bowl. Fold the sauce mixture into the potatoes smoothly. Keep the salad in the fridge and let it chill at least one hour before serving.